PRICE REDUCED - 12 Exclusive Homes 2 or 3 bedroom. Modern town house at Hacienda Hills. Designed & built with a modern twist, CLEAN LINES and ATTENTION TO DETAIL. American style open plan kitchen, Bright spacious living accommodation. Private garden, community gardens and pool. Sunny Orientation. 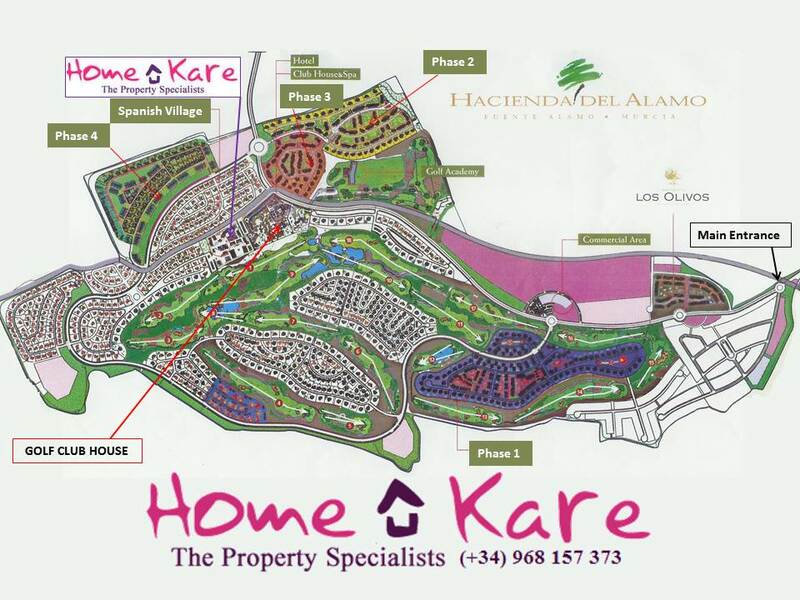 HOME KARE at Hacienda del Alamo are pleased to be able to offer these discounted Villas that are being offered for sale by Sareb, owners of The Resort of HAcienda del Alamo, Please note that internal pictures are from the show villa! External pictures are actual! Stunning key ready townhouse in Hacienda Hills. Bright, spacious, clean lines, modern finishes, thoughtful attention to details, just a few words and phrases that sum up this stunning town houses. American style open plan kitchen with top quality 'white' goods, breakfast bar opens to the formal dining area. A split level lounge adds interest and proportion to the open plan living space on the ground floor. Guest bedroom with lined and fitted wardrobe plus guest bathroom completes the picture on this level. Marble tiled staircase leads to the first floor with the Master Bedroom and private balcony occupying the whole of this floor. Each of the properties partially tiled bath/shower rooms has under floor, marble topped vanity units and heated towel rails. Full length sliding patio windows open from the lounge to a ceramic tiled terrace and low maintenance plot that naturally extends to encompass the delightful community gardens and pristine community swimming pools. Hacienda hills is located within a quieter part of The Resort and a 10 minute walk from the townhouse will find you at the best golf practice facilities here in Murcia and probably some of the best in Spain, (Covered and open 50 bay, two tier driving range, short game and putting greens) compliment by a full size 6 hole Academy Course, alongside this our resident Golf Pro with all the latest equipment for improving your game, there really is no excuse!. Boasting stunning views across HDA's Championship Golf, from the back ties one of the longest courses in Spain, the 5* Club House as the centre point to The Resort is a fantastic place to enjoy a relaxed lunch in the 'a la carte' restaurant or grab a hearty English breakfast or bar snack before Teeing off. Summer evenings watching the sunset from the large terrace over the distant mountains of the 'Sierra Espuña' with a sun downer and sampling the freshly prepared local products is an absolute must! A 5 minute car journey to Fuente Alamo, the local town that pretty much offers most of what you might need on a daily basis with shops, bars and restaurants also has 2 medical centres and a bi-lingual school. Further a field, the major towns of Cartagena and Murcia City are steeped in History and still offer a view of The Real Spain with comparable services and shops of major cities in The UK.